Foxes are vulnerable to and can transmit a number of serious zoonotic diseases including rabies, mange, canine distemper, parvo enteritis, roundworms, and other endoparasites. They also may be involved in the transmission of arboviral diseases vectored by fleas, ticks, and other external parasites that commonly infest wild animals. If you have seen a fox around your house, you need trapper J's Fox Removal Service. In many cases, it's not really necessary to trap fox. Proper sanitation to remove attractants and the construction of secure fences, coops, and pens to exclude foxes and protect livestock are usually sufficient to solve most fox problems. Trapper J provides expert fox exclusion services throughout all of Louisiana. In some cases, fox trapping or fox removal may also be necessary, especially where fox populations are especially high, natural food sources scarce, and fox under increased pressure to find food. 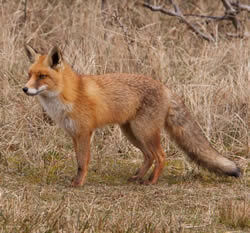 Fox trapping and removal is also needed when a fox is suspected of being rabid or otherwise ill. In addition, foxes who have become a little too comfortable around people also should be trapped and removed because they may attack when unintentionally threatened by humans, especially small children, who may try to pet them. What areas do we provide our Fox removal service? Trapper J, a North Louisiana Nuisance Wildlife Animal Removal specialist is the most professional and humane Fox removal Service available in Monroe, West Monroe, Ruston, Bastrop, Alexandria, and Pineville in the North and Central Louisiana area.